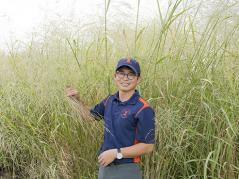 URBANA, Ill. — A University of Illinois crop scientist will lead a team of researchers on a five-year study of new crops that could contribute to the production of affordable, sustainable sources for market-ready fuels and other valuable products. U of I College of Agricultural, Consumer, and Environmental Sciences (ACES) and Department of Crop Sciences Associate Professor D.K. Lee and his collaborators were awarded $5 million from the U.S. Department of Energy (DOE) for a study titled “Next-Generation Feedstocks for the Emerging Bioeconomy.” Other team members in the study funded by the DOE’s Bioenergy Technologies Office (BETO) are from the U.S. Department of Agriculture’s Agricultural Research Service, Iowa State University, South Dakota State University, Argonne National Laboratory, Idaho National Laboratory, and Antares Group Inc. They will collaborate with industry partners POET-DSM Advance Fuels LLC, Enginuity Worldwide LLC, and the Climate Corp. The Institute for Sustainability, Energy, and Environment (iSEE) was instrumental in helping Lee and his team land the grant. iSEE, which helped put forth the successful proposal, is an administrative partner in the new Center for Advanced Bioenergy and Bioproducts Innovation (CABBI), a DOE Bioenergy Research Center that is studying energy crop trait improvement; automated conversion of biomass into useful, valuable chemicals; and studies on the economic and environmental sustainability of CABBI crops and processes.